Antonio Snider–Pellegrini (1802-1885), was a French geographer, who, in 1858, offered a theory(a) that has been seen as a precursor to that of Alfred Wegner’s concept of Continental Drift, which developed into today’s widely accepted model of plate tectonics. It also appears that he thought that the Earth had been much smaller at the time of the biblical Genesis(c), anticipating the Expanding Earth Hypothesis! He is credited with creating the first representation of the Americas joined to Europe and Africa (see below). Snider-Pellegrini published his theories in La Création et ses mystères dévoilés. 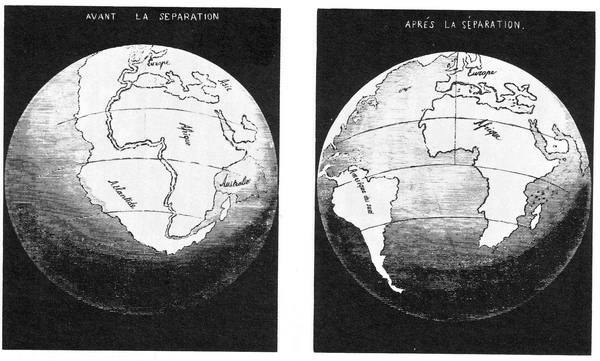 Snider-Pellegrini also added the suggestion that Brazil had been the location of Atlantis.